“Who will rise?” History has just released a new teaser for season five of Vikings. The historical drama takes place in the brutal and mysterious world of Ragnar Lothbrok (Travis Fimmel), a Viking warrior and farmer who yearns to explore (and raid) the distant shores across the ocean. The cast also includes Katheryn Winnick, Clive Standen, Gustaf Skarsgård, Alyssa Sutherland, Linus Roache, and Alexander Ludwig. Season five of Vikings premieres on History on November 29th at 9 p.m. ET/PT. Meanwhile, season six has just begun production. What do you think? Are you a fan of Vikings? Are you excited for season five? More about: History TV shows: canceled or renewed?, Vikings, Vikings: canceled or renewed? 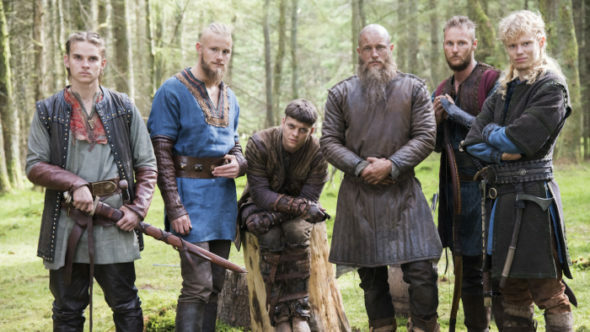 Vikings on History: Cancelled or Renewed for Season Six? Don’t they want to finish it? just looping after looping. This is one of my favorite shows. Can not wait for the next seasons… Love all of the characters!!! I’m so glad this is coming back on. It’s been so long. Can’t wait.